The iconic gatefold matte picture sleeve is one of three early variants with a single side opening & blue credit text on the inside left panel with "Printed and made by Garrod and Lofthouse Ltd."
This example displays some light general wear but has no splits & the edges show just light scuffing with wear mostly on across the front & back. The inner sleeve is a die-cut black poly-lined inner with patent numbers and "Made in Great Britain" in silver at the bottom. It remains unsplit & intact. A) Brown graphics sticker: A brown/dark blue/yellow/green self-adhesive sticker with Dark Side of the Moon graphics. Matte. The backing paper is tan with 45 degree angled diagonal stripes of dark brown from the top to bottom, and "FasPrint Permanent," and "Crack Back Patented." on the paper. There is no catalog number on the sticker. B) Yellow graphics sticker: A yellow/sky blue/green self-adhesive sticker with Dark Side of the Moon graphics. Matte. The backing paper is tan with 45 degree angled diagonal stripes of dark brown from the top to bottom, and "FasPrint Permanent," and "Crack Back Patented." on the paper. There is no catalog number on the sticker. B) Group Poster: A six-pane group shot poster in landscape style with "SHVL 804" in the bottom right corner. Matte. The poster artwork has lost none of its impact with them both in an unused condition. The artwork is unblemished & unfaded. The plain white sides show minimal signs of age. The labels are the all important black label with solid light blue triangle & 'Gramophone Co Ltd' perimeter print. There is a small spot of black paint on the label, otherwise there is no writing but some spindle marks are noticeable by the centre hole to indicate some repeat play [who didn't play this masterpiece?]. The matrices in the run-outs are machine stamped & end A2/B2. This is a nice one owner example. The vinyl is super clean both sides with very little wear to the grooves or paper wear detectable. These first pressings are obviously highly desirable, amongst the reasons for this is that the first batch press is 'TAS' listed, meaning it comes with high praise & distinction by Harry Pearson from The Absolute Sound. We would grade this example a healthy VG+/EX- with light signs of play with minimal impact on playback & great sound performance as expected. 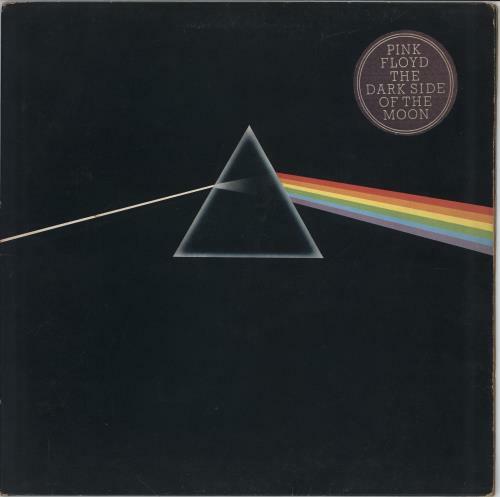 Product Information Pink Floyd The Dark Side Of The Moon - 1st - Complete Stickered - EX UK vinyl LP album (LP record).